It was once said of renowned architect Daniel Burnham that his greatest influence may not have been what he built, but what he imagined. He urged us all to make no little plans, to think big. And that’s exactly what we are doing at EKU as we move forward with a bold and visionary campus renewal plan that will transform the way we learn, live and work together and even change the way others perceive us. Plans continue to unfold for a variety of exciting projects, the cost for which will be covered by an innovative combination of public-private partnerships, private dollars, a recently approved student fee and University funds. Winston Churchill once said, “We shape our buildings; thereafter, they shape us.” Our destiny is in our hands. It is indeed a great time to be a Colonel! As our campus landscape continues to change and improve, I would like to address questions relative to Case Hall and Case Annex, our plans for these structures, and their proposed timeline. I hope the following information is helpful, and I encourage you to contact me with any additional questions or concerns. Within the next few weeks, we will be finalizing our campus master plan with HEWV – the architectural firm hired to help with the process. Once these plans are completed, we will utilize the campus master plan as a guide over the coming years and implement suggested plans as we can. Among the recommendations from HEWV are new traffic patterns throughout campus, additional parking, and a much more pedestrian-friendly environment across EKU. Again, we will undertake those projects which are doable and affordable in the coming months and years. As it relates to Case and Case Annex, our intention is to vacate both structures at the conclusion of this Spring Semester. Students will relocate into other residence halls. Appropriate spaces for faculty and staff have been identified within McCreary and Mattox Halls and in the basement of the University Building. Over the next few weeks, we will prepare these spaces in time for EKU employees to move in and make them their own during the summer months before Fall semester 2016 begins. As you can appreciate, there are countless moving parts with many impacted individuals and timing will be critical. We ask for your patience and cooperation as we move forward with efforts to make EKU a better place for everyone. Once Case and Case Annex are vacated, they will be razed. The site will then be prepped for a new dining facility to be constructed by our food vendor. As plans finalize, we will release the images and plans of this facility – sure to be one of the finest in Kentucky – which will provide our campus with exceptional services and food options. The finished product will breathe new life into the center of campus. We will continue to utilize the Powell Building for food service but once our new dining facility is completed during the Fall Semester 2017, Powell will be vacated so that its renovation can commence. Despite the challenges we are facing with our proposed state budget, it is an exciting time to be at EKU. I thank you for your continued service and commitment. As construction progresses as part of the EKU Campus Revitalization Plan, the Madison and upper Brockton residential lots will close beginning at 4:30 p.m. on Friday, February 19. Additional parking areas are available for residents in the Brockton Lot behind the New Science Building, Existing residential parking in the area also includes the Kit Carson and Telford lots. Residents who do not need daily access to vehicles are encouraged to consider parking options in the Ashland or Perkins lot with shuttle service to central campus areas. 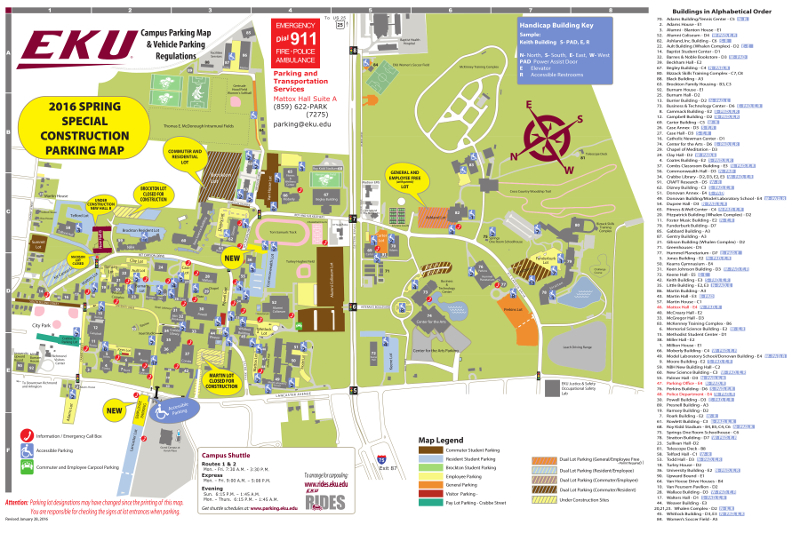 You will find an updated parking map and shuttle information below. Thank you in advance for your patience and understanding as we continue to improve campus housing options and enhance the Campus Beautiful. Over the weekend, construction fencing was erected around Martin Hall and around the Martin and Keith parking lots. Given the needs for ingress and egress for demolition and construction machinery and workers – and the narrowness of the exit onto Lancaster Avenue -- it has become necessary to close the Keith Lot. 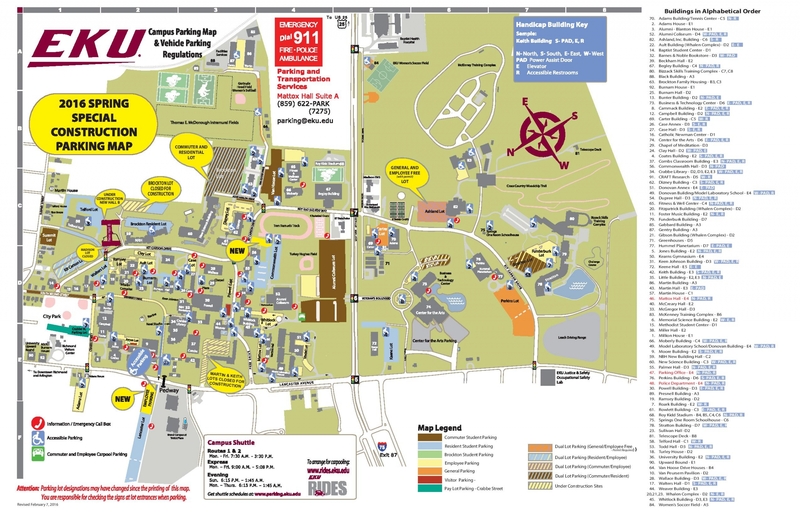 However, additional accessible spaces will be provided along University Drive as noted in the map below. Please note these changes. Temporary signage has been placed to reserve these spaces along University Drive and permanent spots will be established in the next few days. Please plan accordingly as you make your way to campus tomorrow. Proximate parking to some buildings has been removed so that these improvement projects can move forward. We very much appreciate your patience throughout this process as we endeavor to continually enhance the living and learnings spaces at EKU. The updated parking map below contains additional details of how lots will be configured/zoned in the near future and which ones will be closed. The Martin Lot will begin being closed off Friday, February 4, at 4:30 pm, with fencing going up this weekend. This will be the staging area for the new Martin Hall replacement project. The Brockton Resident Lot and Madison Lot changes will take place mid-February once the fencing is prepared and put into place. The target date for these changes is February 18, 2016. The Brockton Lot (across from the Rec Center and currently zoned as commuter only) will consist of residential parking as well. This change will go into effect immediately. Thanks for your continued patience as we work to improve our facilities and upgrade our infrastructure. After a rigorous search process that elicited responses from several national firms, Eastern Kentucky University has issued a letter of intent to award the development of its new student housing projects between F2 Companies of Columbus, Ohio, and Grand Campus Properties of Richmond, Kentucky. This is the first public-private partnership (P3) project for the University. 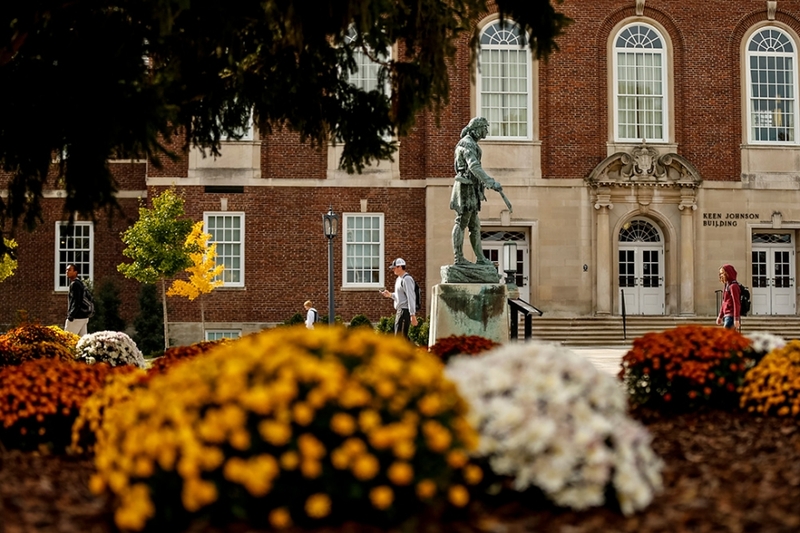 “The proposal we selected includes all the elements we sought, plus some value added components that will transform our campus now and well into the future," said Dr. Laurie Carter, EKU Executive Vice President and General Counsel. The winning proposal includes more than 1,100 beds on the sites of Martin Hall and the current Brockton Block on Kit Carson Drive. It is anticipated that both new halls, totaling $75 million in new construction, will be completed in time for occupancy in Fall 2017. It is an exciting time to be at Eastern Kentucky University. President Michael T. Benson is leading the University in a revitalization of campus that will enhance the student experience. The success of our students is in the forefront of every decision we make related to rebuilding or enhancing our facilities. EKU is implementing an aggressive timeline in order to have new housing for residents by Fall 2017. The first phase of the process is to raze Martin Hall. The work will begin in February 2016. University Housing is developing a plan to relocate all students currently living in Martin Hall. We will make the transition as seamless as possible. An exact plan of action will be communicated as details are finalized. Transparency is a cornerstone of our action plan as we move forward together. We will continue to communicate with you openly through each phase of this process. Every affected student will have a place to live. Every affected student will retain the Martin Hall price point for the remainder of the year. Martin Hall residents will have first priority for housing in the new residence hall to be completed in Fall 2017. Residents who choose to be proactive in finding a permanent space on campus are encouraged to participate in room changes September 8th-14th with the rest of the campus community. This will not be the only opportunity for Martin Hall students to move. However, it is the earliest time for students to find a permanent assignment in another residence hall. If you do not submit a room change request all remaining Martin Hall residents will be placed in housing assignments in January. 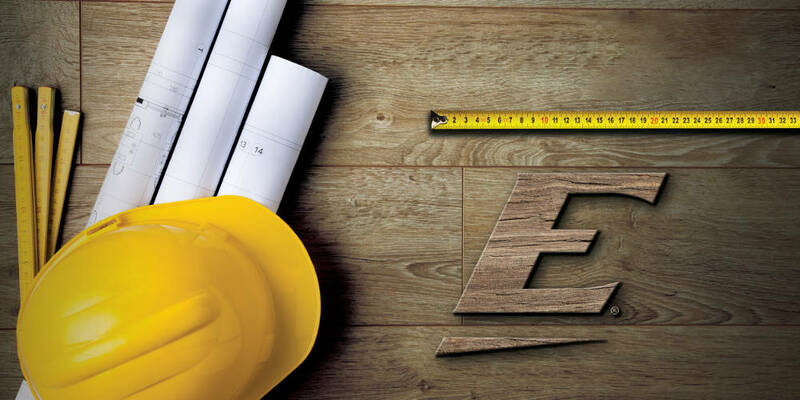 We have created a Question and Answer page at ekubuilds.eku.edu/martinhall to address the questions we believe will be most common. Housing will continue to update the page as more details become available and staff will be available to provide information and assistance throughout the moving process. Again, we are committed to your success and will work diligently to provide a smooth transition. When will I have to move? Martin Hall is scheduled for demolition in February 2016. All students must be moved by February 1st. Residents who choose to be proactive in finding a permanent space on campus are encouraged to participate in room changes September 8th-14th. If you do not submit a room change request all remaining Martin Hall residents will be placed in housing assignments in January 2016. Martin Hall residents can start moving into open spaces on campus when room changes begin on September 8th 2015. Permanent housing assignments for all remaining Martin Hall residents will be made in January 2016. Where will I have to move? Martin Hall residents will be able to move into any open space in any residence hall where they are eligible for residency. Priority will be given to Martin Hall residents once consolidation is complete in September 2015. Will I be able to live in the new residence hall? Residents of Martin Hall will be given first priority for housing placements in the new residence hall when it is completed in Fall 2017. What if there isn’t room? 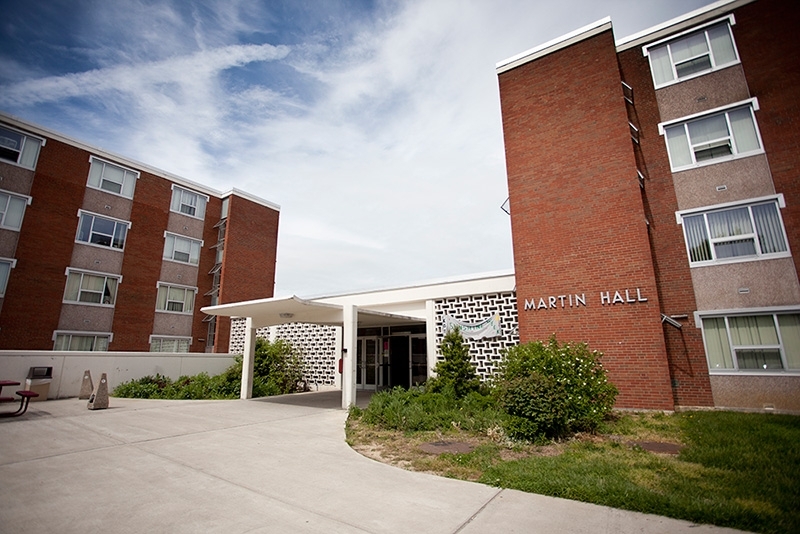 EKU Housing will provide an assignment for all Martin Hall residents. Will I have to pay the higher residence hall rate? No, Martin Hall residents will stay at the Martin Hall price point for the remainder of the academic year. Will I have help moving? We want to make this a smooth transition and housing will organize volunteers to help move students’ belongings. Students will also be able to check out dollies to assist in the moving process. Will I get to stay with my roommate? Housing is making every effort possible to consolidate students when full rooms open up (priority will be given to Martin Hall residents), however we cannot guarantee roommates will be able to stay together. Can I be released from my Housing Contract? Because we will be placing you into a comparable or upgraded residence hall we will not need to release residents from their housing contract. What will happen to the staff positions at Martin Hall? Martin Hall staff will remain EKU Housing staff members with the same benefits. The details on staff reassignments are still being determined but they will continue to have employment with EKU Housing. Why do students need to move during the academic year? Why does the construction have to begin during the academic year? EKU is working with a master planner who is leading the campus revitalization. The residence hall plan calls for a new residence hall to be constructed and ready for opening in Fall 2017. To meet this deadline the developer determined the site preparations and construction would need to begin no later than February 2016. Why were students allowed to move into Martin Hall when there were already plans to raze the building? Why did we not know about this earlier? Working with the master planner for the EKU campus revitalization initiative, developers determined in early September 2015 that Martin Hall should be the first phase of planned residential housing upgrades. To ensure transparency about information concerning the campus revitalization, Martin Hall residents were notified. Fall 2015 housing assignments were made beginning in January of 2015 through August 2015 before building plans had been finalized. To learn more about the room change request process please visit https://housing.eku.edu/insidelook/fall-2015-room-changes. Eastern Kentucky University is partnering with HEWV Architects P.S.C. to develop a comprehensive New Campus Master Plan and Space Utilization Program for Eastern Kentucky University and the Eastern Kentucky University Foundation’s Properties. Properties include: EKU’s main campus, and regional campus sites in Corbin, Manchester, Danville, Lancaster, Hazard, Somerset. Together, the University and HEWV will guide the evolution and preservation of the University and Foundation property. This planning exercise will be inclusive and involve the entire university community, as well as local leaders and alumni. To learn more about the master planning process that is currently underway on campus. View the introduction to the Master Planning Process. 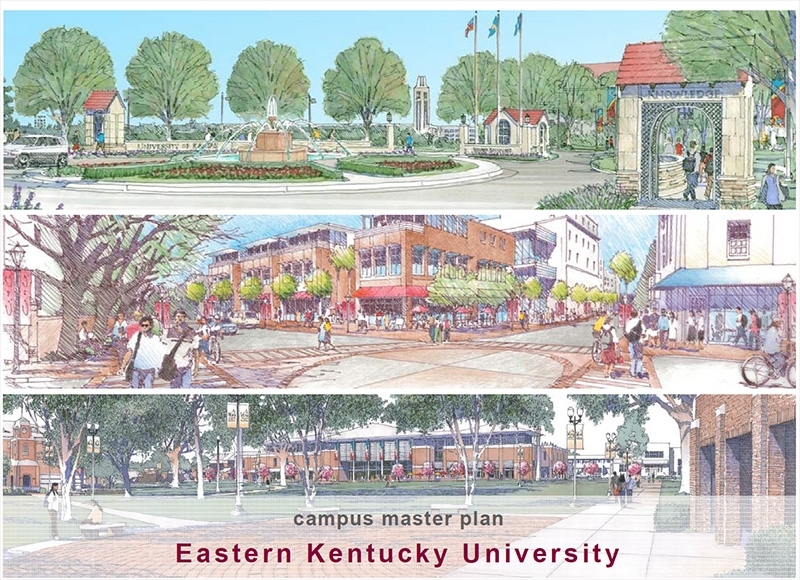 Eastern Kentucky University updated the community and campus about the many ongoing and planned campus revitalization initiatives in a Town and Gown Vision 2020 Forum Tuesday evening, June 30, 6-8 p.m. at the EKU Center for the Arts. Dr. Benson was joined on the Center’s main stage by members of the President's Council, City, and County officials. The discussion explored ways that the University and City can partner together for mutual benefits. The President’s remarks included a multimedia presentation that details many of the University’s projects and plans. Watch the video of the Town and Gown Vision 2020 Forum. Eastern Kentucky University fraternities and sororities will be included in discussions about future housing arrangements on the Richmond campus. Todd and Dupree Halls, commonly known as the Greek Towers, will come down sometime in the next few years as the University continues its campus-wide revitalization process, particularly in the heart of campus, and addresses a need for more modern housing options. The EKU Board of Regents recently approved razing Todd, Dupree and Martin residence halls and substituting on the same sites new, suite-style residential housing, to be financed by public-private partnerships. The Board also approved the demolition of about 40 housing units in the 700/800 area of Brockton. Billy Martin, executive director of student life and auxiliary services, emphasized that, while the exact timetable for the work is yet to be determined, the EKU Greek community will have a voice in the decision-making process. Whenever the work is complete, the end result will be approximately 1,500 new suite-style rooms. 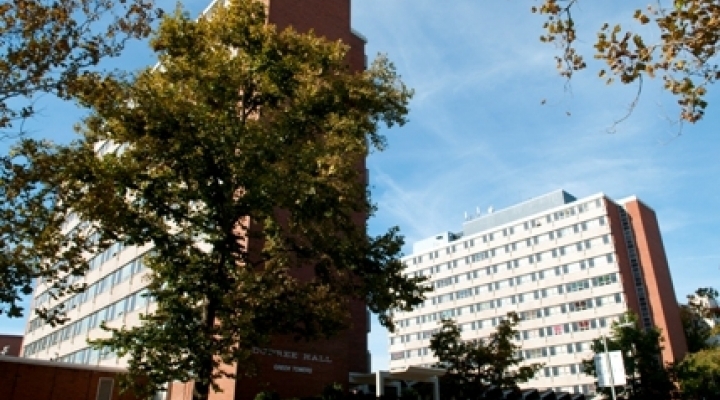 Dupree and Todd halls, which opened in 1964, are 11 stories and house approximately 340 students each. Martin Hall, which opened in 1962, is four stories and houses up to 400 students. Those three facilities were selected, Martin said, because they could not easily be upgraded to a format today’s students demand. The move to modernize the University’s housing stock also dovetails with the University’s commitment to student success. Studies have shown that students who live on campus are more likely to persevere and graduate.